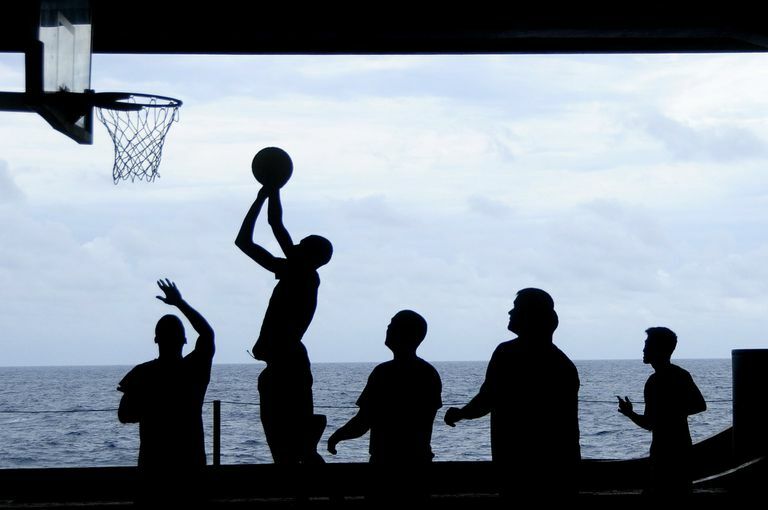 If you're a fan of basketball, there's nothing that's quite as fun as playing a fast-paced game of hoops no matter where you are. Most basketball game apps require you to have an active internet connection to play. But the following games don't have that limitation. So disconnect your Wi-Fi, shut off your mobile data, then sit back and launch one of these great basketball games for offline play. Full screen ads between rounds. Basketball Shoot is an extremely addictive, free basketball game for mobile devices. You may not go head-to-head team against teams, but if your favorite part of playing basketball is free shooting, this is the game for you. The more you play, the better you'll get. The better you get, the more you'll rack up points and unlock additional basketballs of varying styles you can play with. The controls only require a single finger to play, and the game mechanics are very precise. Start lining up each shot using the virtual ball path even before the last ball slips through the hoop. The faster you shoot within the time limit, the more points you'll rack up! The only limitation is that you'll have to put up with full screen ads between every round. Need for perfect timing can be frustrating. This is easily the best basketball game to play offline if you prefer a full game experience. You'll start out learning how to use the joystick in the left bottom corner of the screen to control your player. Tapping the Shoot button on the right and releasing at the top of your jump sinks the ball into the hoop every time. As you perfect your style, you'll learn how to perform various dunk styles. Once you're ready to get in on some action, you'll choose actual team games to play. Play well, and you'll unlock better sneakers to play in. In offline mode you'll play against skilled AI players from across the globe. The game doesn't have ads, but features lots of in-game purchases to boost your game. Fun for fans of sports stats. Somewhat of a learning curve. If your love of the game of basketball centers around player and team stats, then you'll love Rival Stars Basketball. You'll give your team a leg up on the competition by putting together a team of players that have the best defensive and offensive stats. If your teams stats are well balanced, you stand excellent odds of beating the opposing team. As the game progresses, you choose from your player cards to square off against players from the opposing team. The idea is to pair off your players with strong defensive skills against players on offense, and vice versa. Choose well, and your team will achieve a "hot streak" with lots of baskets, and a higher score in the end. There are a few scenes where you control the action on the court, but momst of this game is centered around choosing the right players, at the right time, with the right stats. There are a few ads throughout the game, but most of the time you'll notice in-app purchase options that'll give your team an advantage. Imagine playing basketball with no hands, and only your head. That's what Head Basketball is all about. You'll face off against an AI player. The goal of the game is to run back and forth on the court and use only your head to bounce the basketball into your basket. You can also swing (to attack the opposing player), or jump. Arcade: Go head-to-head (literally!) in random games. Campaign: Build your score in a series games. Tournament: Play against AI opponents from across the world. Survival: You only get one shot to win the game. League: Play against others in a real-world league. Multiplayer: Play against your friends in online mode. Only League and Multiplayer isn't available in offline mode, but all other forms of play are available offline against AI opponents. Need for perfect timing is frustrating. If you prefer using a keyboard instead of a mobile screen, there are plenty of offline basketball games you can play on Windows 10. Basketball Stars is a 3D basketball game where you need to line up each shot to make each basket. This is a game of reflexes. A fast-moving basketball slides back and forth across a red crosshair. You need to tap the space key (or touch the screen if your computer has a touch screen) to stop the ball in the center of the crosshairs. You'll repeat this for both horizontal and vertical alignment. If you're accurate enough, your player will make the shot. It's a fairly simple game, but also very addictive! Tedious after a few rounds. Big Head Basketball follows the same basic concept as the mobile game Head Basketball. In fact if you have a Windows tablet, you can control your character by tapping the screen. However, the game is much more fun using the keyboard. Control your character with the left and right arrow keys. Jump with the space bar. The goal from the moment the ball is released is to bounce the ball on your head (or your opponent's head!) all the way to your basket. If you're lucky, you'll bounce it right in. As you gain points, you'll unlock new characters or player skills that'll give you an even better advantage in the game. This game for Windows 10 puts a whole new twist on the game of basketball. The goal is simple enough. You're a basketball with wings. Every time you press the Space key (or touch the screen, if you have a touch screen), you'll flap your wings. Every flap lifts the ball higher. Lift your ball just high enough to drop it through each hoop, and you'll keep your wings. You'll need to make the ball through each hoop to make it through the entire round. There are lots of things that'll make you lose your wings (and lose the round). It sounds easy, but it's deceptively difficult. The problem is that every time you lose, you're going to want to make another attempt "just one more time". Keep telling yourself that after your hundredth attempt! There are lots of ads packed into this game, but the wait is worth it. It isn't easy to find many apps you can use offline these days, let alone basketball game apps. But as you can see, whether you're playing on a mobile device or your home computer, there are plenty of options. So download one of these games, unplug the internet, and settle in for a long night of hoops.